People often complain that there's an overabundance of zombie-based video games, or that zombies are the new bacon, overindulged in to the point of nausea. 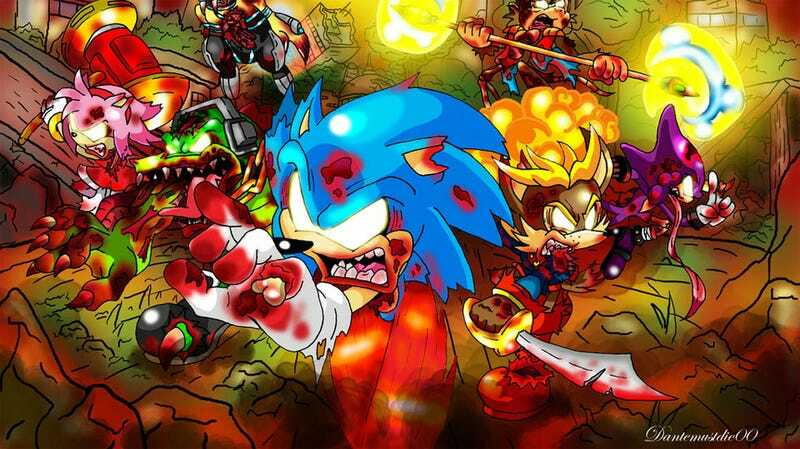 Judging by pieces like Deviant artist Dantemustdie00's "Sonic Zombies", perhaps we're just injecting the undead into the wrong titles. I mean, Call of Duty is nice and all, and war-plus-zombies has been a winning combination since the early days of horror comics. But a gritty war game is exactly where you'd expect zombies to show up. Sonic the Hedgehog's world, in contrast, is colorful, bright and lively. Wouldn't that contrast make for an even more terrifying undead outbreak? Here are some more examples of our cuddly video game friends reanimated for sinister purposes. It's important to note that the zombification of our purest heroes isn't just the purview of the talented fan artist. Professional person of art Dan Hipp, who you might remember from multiple Kotaku stories, took on the darker, deader side of Legend of Zelda's hero Link in a post to his site back in October. This proves (to me, at least) that everybody, no matter how accomplished, wants to see innocent game characters slaughtered and then brought back to life. The most disturbing aspect of Deviant artist littlenatnatz101's "Super Zombie Mario" isn't that the mushroom seems to have two bullet holes in its cap much smaller than your average Bullet Bill. No, it's because this work was a labor of love, created for a boyfriend that loves both Mario and Zombies. Nothing says love like rotting video game characters, especially ones that sound like a gurgling Charles Martinet. With both Mario and Link represented, it might seem that Nintendo is being picked on, or perhaps picked at until it becomes infected and the inevitable occurs. That's not the case at all; it's just that company's stable of lovable mascot characters is perfect for perverting. Even characters the company itself doesn't love. Freelance illustrator Josh Mirman has an entire series of twisted undead characters lurking around his Deviant art page, eating the brains of the less wary contributors. Thank you, Josh. But there is undeath beyond Nintendo. Just look at the decomposition on this lovely lass. Deviant's DazTibbles created this chunk-missing Chun-Li (he's got a wonderful Cammy as well), who actually looks even better in line-art form. It demonstrates a hidden side-effect of having thighs the size of tree trunks: more meat to cling to the bone. Ten years from now, when all the other zombies have fallen apart, Chun-Li will finally look like a normal young woman. Well, except the whole dead thing. And finally, speaking of Capcom and dead things, we have this lovely painting by Edbot5000, depicting what a pair of classic characters might look today.